Project Elefont: LOCAL 365 ( 1yr Anniversary) Space Gallery! The 1st Anniversary Art & Music Party!Created to nurture community, collaboration, and cohesion within the local arts and music scene, Local365 unites San Francisco Bay Area’s finest artists and musicians to collaborate and inspire each other’s creations while making our local creative culture more visible and accessible to the public. 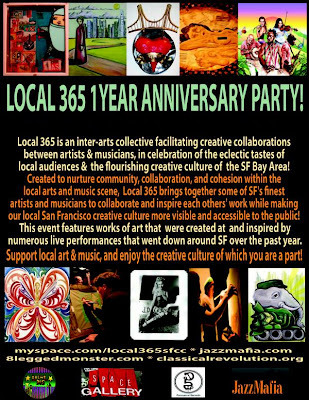 This event showcases extravagant works of art that were created at, and inspired by numerous eclectic live performances that rocked the Bay Area over the past year!Make use of this unique opportunity to support the local San Francisco Bay Area creative culture of which you are a part! !